THE ARRIVAL OF THE MAIL TRAIN at Saw Mills Station. The Rhodesia Railways control 1,526 miles of 3 ft 6 in gauge track. The first section of line now operated by this company was opened in 1894 from Vryburg to Mafeking. THE rich and important country of Rhodesia owes its name and development to a railway-minded imperialist, Cecil Rhodes. This dynamic personality had a vision of a Cape to Cairo Railway, and began to put his dream into effect. Although the railway as he planned it does not exist in its entirety, Rhodesia has been developed mainly by this means. The territory, which lies near the middle of Africa, is linked by rail with Cape Town and Durban, and also with Beira, the port in Portuguese East Africa through which passes the bulk of its import and export trade. From 1889 until October, 1923, this wide expanse of more than 430,000 square miles was administered by the British South Africa Company under Royal Charter, In 1923 Southern Rhodesia was annexed to the Crown, and granted responsible government as a self-governing colony. Southern Rhodesia is 150,354 square miles in extent, and at the 1934 census 52,950 of the 1,154,000 inhabitants were Europeans. Northern Rhodesia, which was taken over by the Crown in 1924, is 287,590 square miles in area, and has 11,300 European and 1,371,200 native inhabitants. Although the administration of the country is no longer in the hands of the great company which opened it up, the railways were not taken over by the Crown, but are controlled by the Rhodesia Railways, Limited. This company also controls the railway which links Rhodesia with Beira, in Portuguese East Africa. Southern Rhodesia, comprising the provinces of Mashonaland and Matabeleland, is a high plateau between the Limpopo and Zambesi rivers, eminently fitted for European settlement. The capital, Salisbury, is the chief town of Mashonaland, and Bulawayo is the chief town in Matabeleland. Umtali, Gwelo and Gatooma are other important towns. The River Zambesi separates Northern and Southern Rhodesia. Northern Rhodesia is for the greater part a high and healthy plateau with valuable mineral deposits, and equally suitable for European settlement. Even before the charter was granted to the British South Africa Company, Rhodes had obtained certain rights over the land lying to the north of Kimberley, where the Cape railway system then ended. In 1893 the railway had reached north to Vryburg, which is 588 miles from Bulawayo. The advance of the rails towards Rhodesia began from Vryburg in May, 1893, and by October, 1894, Mafeking was reached. Cecil Rhodes, who was determined to keep the cost of construction low, had set a limit of about £5,000 a mile for the 3 ft 6-in gauge track. The engineering work was, therefore, kept as simple as possible. While the track was being laid the colonisation of Rhodesia was proceeding, but not uneventfully. LOOKING SOUTH towards Victoria Falls at Broken Hill Railway Station on the main line in Northern Rhodesia. The section between Kalomo and Broken Hill, a distance of 281 miles, was built by the Mashonaland Railway Company and completed in 1903. Lobengula, king of the Matabele nation, broke his treaty of “Peace and Amity”. The Matabeles had continued their habit of raiding and looting the Mashonas, and had stopped and plundered white men. One impi raided Victoria and speared natives in the streets of the town. After some fighting, Bulawayo, Lobengula’s capital, was occupied, after the king had set fire to it and fled. He was pursued and, in December, 1893, a small reconnoitring party of his pursuers, under Major Alan Wilson, was cut off from the main body by the flooding river, and overwhelmed and killed by Lobengula’s bodyguard. Lobengula retired towards the Zambesi and died shortly afterwards. The famous raid into the Transvaal made by Dr. Jameson with a force largely composed of the company’s police at the end of 1895 deprived the country of part of its police protection. The restive Matabeles rose in March, 1896, and when the white settlers in Mashonaland went to the aid of those in Matabeleland, the Mashonas rebelled also. Rhodes decided that the railway must be built as rapidly as possible, and gave orders that the rails must reach Bulawayo before the end of 1897, as, in addition to the war, an epidemic of rinderpest in Rhodesia had broken out, killing the cattle and stopping all forms of animal-drawn transport. In those pre-motor transport days the railway builders brought up traction engines to use between the railhead and the construction camps when they had no animals. 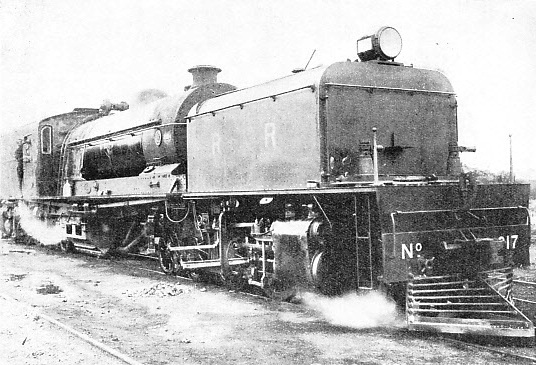 At the time when Rhodes gave the command to press forward the railhead was 492 miles from Bulawayo. The contractors enrolled large forces of natives and achieved the feat of laying 492 miles of track in 500 working days, reaching Bulawayo in October, 1897, soon after the rebellion had been put down. Because of the need for urgency and the restrictions on cost the terms governing construction were not very exacting. They were that the line should “be capable of effectually conveying traffic at a speed of twelve miles an hour on completion”, and that gradients and curves were not to be sharper and heavier than usual for a line of this gauge. Ballasting was to be used only on those parts of the line where it was necessary to ensure safety during the rainy season. Wherever the surface of the ground was even it was followed, the steel sleepers being packed with the minimum of ballast. Shallow streams and rivers were not bridged, the line being taken across over a ford. Sometimes the water rose above the rails. The train would proceed carefully down the bank and send up a shower of spray when it ran into the water. 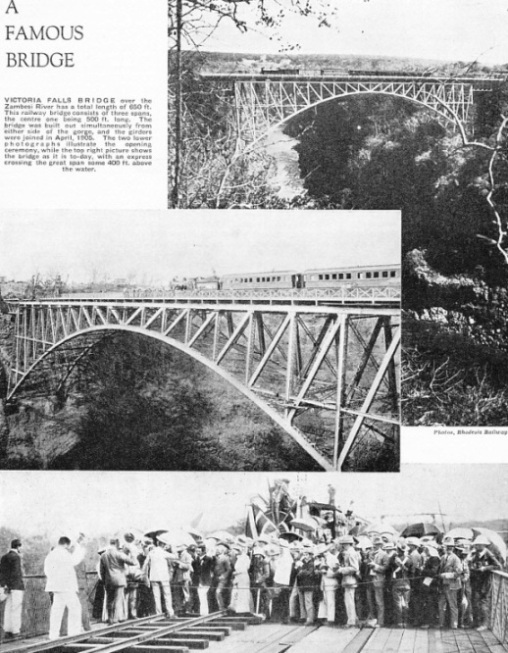 The line was later improved and the fords were replaced by steel bridges. Meanwhile communication was being established with the port of Beira, which is the natural outlet for Rhodesia’s trade. A narrow gauge line was built by the Beira Railway Company (which had been formed by the British South Africa Company) from Fontesvilla on the Pungue River, thirty-five and a half miles from Beira, to Umtali, on the eastern border of Southern Rhodesia. This line was begun in September, 1892, and completed in February, 1898. The Beira Junction Railway, conn-ecting Fontesvilla with the port, was completed in October, 1896. This line from Umtali to the coast had a gauge of only 2 ft, whereas the gauge of the line from Umtali to Salisbury, built by the Mashonaland Railway Company, and completed in May, 1899, was 3 ft 6-in. UNLOADING A LOCOMOTIVE from the SS Clan Mackenzie for the Rhodesia Railways. 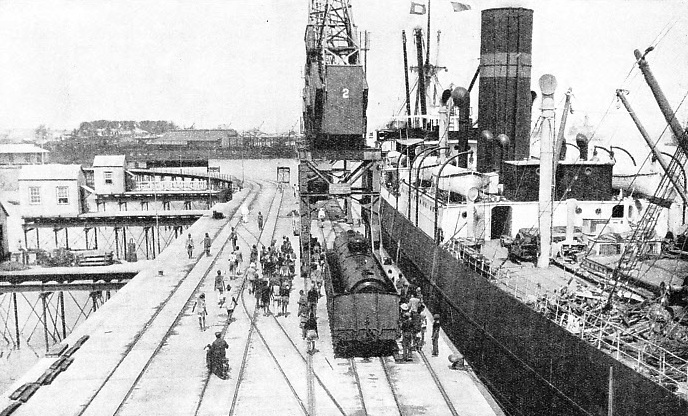 The photograph shows the quay at Beira in Portuguese East Africa. The important line from this port to Umtali in Southern Rhodesia is worked by the Rhodesia Railways for the Beira Railway Company. The inevitable result of difference in gauges followed when goods began to flow from Rhodesia to the coast. The line to Beira was therefore re-laid to the 3 ft 6-in gauge at a cost of about £800,000 for the 204 miles, the conversion being completed on August 1, 1900. About 1,000 white men and 6,000 natives were employed on the widening, which was effected without interruption of traffic. The new alinement shortened the total length by about twelve miles, without taking the track away from the settlements that had sprung up along the route. At first it was intended to take the main line northwards from Bulawayo through Gwelo, and more or less straight up to the southern end of Lake Tanganyika by the most direct route, as part of the Cape to Cairo plan. Work upon the extension to Gwelo was begun in June, 1899. In October, however, the Boer War broke out, and work was stopped, as materials and stores could not be obtained from the south. 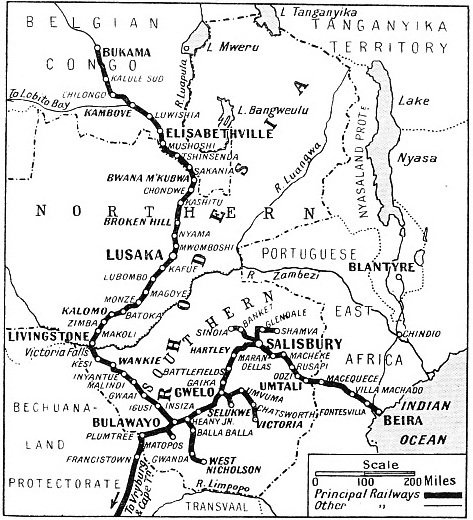 It was therefore decided to utilize the route to Beira by extending the line from Salisbury to meet the line coming up from the south, and the rails were linked at a point fifty miles east of Bulawayo on October 6, 1902. Further exploration indicated very difficult and costly construction on the original “Cape to Cairo” route to the north. More-over, important and valuable coal deposits near Wankie were discovered, and it was decided to abandon the original route and to take the line from Bulawayo north-west through Wankie and across the Victoria Falls. Wankie was reached in September, 1903. Rhodes had died in March, 1902, and the body of the Victorian imperialist was taken from a cottage on the shore near Cape Town to the burial place he had chosen in the Matopos, in the country which he had founded and to which he had given his name. His associate, Alfred Beit, who died in July, 1906, left a large sum for the development of railways. Beyond the Wankie coalfield the railway engineers encountered the first serious physical difficulty - and one of such dimensions that it more than balanced the previous easy construction. The problem was nothing less than the Victoria Falls on the Zambesi River. The location of the line compelled a crossing of this mighty waterway just below the cataract, where the water, after tumbling over the ledge, is forced through a deep, narrow gorge 400 ft deep. Dr. Livingstone discovered the Victoria Falls in 1855. They have not been brought about by any volcanic agency, but by a check to a deeper erosion of the bed of the river. This check is a resisting sheet of basalt about 200 miles wide, at an altitude of 2,900 ft. At one time the river was much higher and wider than it is now. It gradually cut a way down to the bare basalt. The original native name for the falls is “Shongwe”, which means “boiling water in a pot”. The falls are about two and a half times as high as those of Niagara, having a height of 420 ft and a width of a mile and a quarter. In flood time the noise can be heard ten miles away, and the spray can be seen seventy miles away. The site selected for the railway bridge, just below the falls, is at the first arm of the gorge, some 200 yds below the “Boiling Pot”. Rhodes desired the bridge to be near the falls so that in flood time the spray would reach the carriage windows and impress the passengers; his wish was carried out. The walls of the gorge are almost sheer, and the surveys showed that the bridge would have to comprise a single span about 500 ft long with the rails 420 ft above low water. At the time it was built the bridge was the highest above water level in the world, but it has now relinquished its title in favour of the Fades Viaduct, in Puy de Dome, France, the central 472-ft span of which is 434 ft above the Sioule River. The first difficulty was to establish communication with the opposite bank to avoid a detour of about ten miles. The two camps were pitched on the cliffs and a telephone wire was thrown across the gorge by means of a rocket. The rocket, with a length of thin string attached to the stick, was fired across the chasm. The opposite party secured the stick and the string, and by the string hauled across first a stouter length, and then one still stronger, and then the telephone wire. Before the rocket was fired, attempts had been made to fly a string across by means of a kite, but this ingenious effort was foiled by the eddies and currents of air from the tumultuous waters which tossed the kite in every direction but the right one. A second rocket was fired, and this time a marked wire was handed across, to measure the width of the gap, a spring balance being used at one end to calculate the sag of the wire. In this way the surveys were counterchecked. The bridge was designed by Mr. G. A. Hobson, and construction was begun by the Cleveland Engineering and Bridge Building Company of Darlington. The main span of 500 ft is a graceful arch of steel. The total length of the bridge is 650 ft. At the sides the steelwork deepens to 105 ft, tapering in the centre to 15 ft. On either side the cliff-face was blasted out to provide the foundations for the main span. An overhead cable-way was slung across the gorge to enable the bridge to be built, and this was used to take men and materials from the south bank, to which they had been brought by the railway, across to the north bank. The workmen were carried in a little cage, and the few tourists who arrived made trips in this cage at ten shillings a head. A net was slung across the chasm under the bridge in the event of any workman slipping or dropping a tool. About eighteen months after work on the bridge had begun the first train crossed. The work had been done by natives, supervised by white foremen and engineers. In 1904, when the Victoria Bridge was being completed, the track to the north was being hurried on towards Kalomo. On this section, the engineer, Sir Charles Metcalfe, Bart., surprised a French railway engineer who asked him how many miles of track could be laid in a day. Sir Charles retaliated by asking his French guest to give an estimate, and the Frenchman said that he reckoned that half a mile a day would be a fair estimate. Sir Charles had a few words aside with the engineer in charge, and the engineer had a few words with the foremen, and the foremen had a few words with the native labourers. Then Sir Charles gave the word “Go”, and he and his French guest took out their watches. In twenty minutes a quarter of a mile of track had been laid, and the French engineer left, astonished, and full of admiration. Sir Charles himself was so much impressed that he decided to see what could be achieved if everybody made a special effort. He had a talk with his British foremen and engineers, the natives were marshalled up and put on their mettle, and the ten hours’ day started. This appeal to the sporting instincts of natives who, a few years before, had been fighting the white man, yielded the desired result. They went ahead and set up what was then a world’s record. When their ten hours' labour was over the rails had gone forward five and three-quarter miles. This figure easily beat the four and a half miles a day of the mechanical tracklayer used in the United States at that time. THE RAILWAYS SERVING RHODESIA are shown on this map, together with the main towns and settlements that are linked by them. 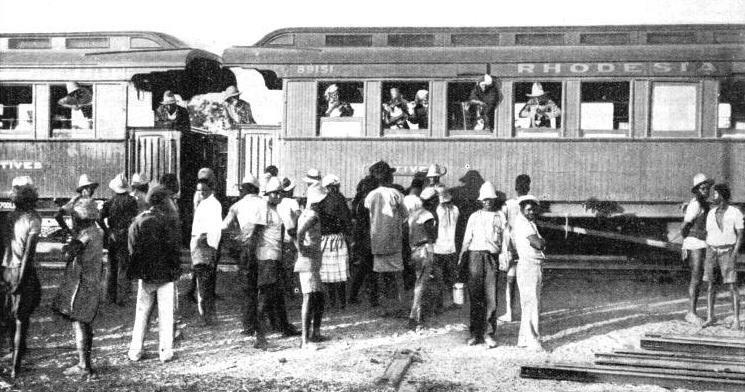 When Kalomo, in north-western Rhodesia, ninety-four miles beyond the Victoria Bridge and 1,733 miles from Cape Town, was reached in July, 1904, there was a halt, for financial reasons. The Mashonaland Railway Company then undertook the next section of 281 miles to Broken Hill; this was completed on January 11, 1906. This part of the railway system contained the formidable obstacle of the Kafue River, the most important tributary of the Zambesi River. At the point where the railway had to cross, a bridge 1,300 ft in length, and at that time the longest in Africa, was called for. In the dry season the river is about 9 ft deep, but when the rains begin it swells to about double this depth, although the speed of the current is not great. Mr. G. A. Hobson, designer of the Victoria Bridge, designed this bridge also, a structure of thirteen 100-ft spans, the work of construction on the spot being carried out by Mr. A. L. Lawley as supervising engineer. The steelwork was prepared in England, shipped to Cape Town, and then carried some 2,000 miles up country by rail to a yard improvised on the river bank, where it was assembled to form the spans. A steel pontoon was sent up in pieces, assembled on the bank, launched, and used to float the spans into position and to carry material across the river. This pontoon was pulled from bank to bank by a wire cable, driven by a steam engine. The spans of the bridge, which is of the lattice girder type, are supported on masonry piers, each 18 ft wide by 8 ft thick. The rock and gravel foundation of the bed of the river gave a first-class foundation. The piers were pushed forward during the dry season, and the steelwork was set directly the river was at flood-level. Timber coffer-dams were erected round the sites of the piers, and the interior was pumped clear of water to enable the workmen to set the stones. While this work was proceeding other gangs were riveting the steelwork of the bridge. Each 100-ft span was 14 ft wide, 20-ft high and weighed fifty-six tons. The pontoon was 95 ft long and 45 ft wide. By the time the masonry of the piers was finished the spans were ready. VICTORIA FALLS BRIDGE over the Zambesi River has a total length of 650 ft. This railway bridge consists of three spans, the centre one being 500 ft long. The bridge was built out simultaneously from either side of the gorge, and the girders were joined in April, 1905. The two lower photographs illustrate the opening ceremony, while the top right picture shows the bridge as it is to-day, with an express crossing the great span some 400 ft above the water. The spans were launched by means of greased rails on to the pontoon, which was swung into position by the cable. The spans were lifted to the piers by hydraulic jacks, the thirteen spans being set in position within eight days. The steel weighed 728 tons and the cost of the bridge was £50,000. When Broken Hill was reached there was a halt for a little while until the mineral wealth of the Katanga region in the Belgian Congo was developed, and the need for obtaining more traffic to make the railway pay impelled the owners to carry the line to the Congo border, which was reached in November, 1909. In addition to the main line, several branch lines were built. In the first instance nearly all of these were made to tap mineral wealth. For example, the branch from Salisbury to Sinoia was intended originally to serve the Ayrshire and Eldorado Mines. The branch from Salisbury to the highly cultivated country opened up by the building of the Mazoe Dam and its irrigation scheme was originally built to serve the Shamva Mines. From Gwelo to Fort Victoria, 123 miles, the branch was built in the first place to serve the Falcon Mines at Umvuma, the line being extended to Fort Victoria towards the Zimbabwe Ruins. Readers of Sir Rider Haggard’s “Allan Quatermain”, “Dawn”, “King Solomon’s Mines”, and “She” need no introduction to these ruins, the origin of which is still unknown. The branch from Gwelo to Selukwe, twenty-two miles in length, constructed to open up gold mines, later became important because of chrome ore and asbestos deposits. The branch from Heany Junction to West Nicholson was built to serve gold mines in the Gwanda district. From Vryburg to Bulawayo the distance by rail is 588 miles; from Bulawayo to the Congo border is 788 miles; from Bulawayo to Salisbury is 299 miles, and from Salisbury to Beira 374 miles. The most difficult country traversed is not in Rhodesia, but on the 204 miles of line from Umtali to Beira, through Port-uguese territory. Soon after leaving Umtali the train descends rapidly over the escarpment to the Portuguese township of Macequece, the line falling about 1,000 ft in twenty miles. As the train twists and turns along the sides of the hills the track can be seen miles away in the valley below. The journey between this town and Vila Pery is interesting, the train travelling for some forty miles through broken country with rocky, fantastically-shaped kopjes, Considerable streams are crossed, and there is also a rich agricultural plateau which extends for about thirty miles to Maforga. The line then descends over the Amatongas escarpment and winds through the beautiful Amatongas Forest, the vegetation at this lower level becoming tropical, with giant trees and creepers. Passing out of the foothills and emerging on to the plains, almost at sea-level, about 140 miles from Umtali, the railway goes on for some twenty-five miles to the Pungue River at Fontesvilla. As stated earlier in this chapter, Fontesvilla was originally the terminus of the narrow-gauge railway. A BEYER-GARRATT articulated locomotive which operates on the Beira line in Rhodesia and hauls heavy trains over difficult stretches of line with numerous steep gradients and reverse curves. These engines have proved very successful and there are many of them in use at the present time. Most of the rails in Rhodesia are in 60-lb sections, and the sleepers are mostly of steel, although native timber has been used to some extent. The principal workshops are at Bulawayo, which is the most important railway centre. The workshops are able to deal with repairs of the heaviest description, the equipment including 60-ton travelling cranes, electric traversers, and modern plant. The railway water supply scheme includes a dam on the Khami River, some eighteen miles away, which provides storage for 170 million gallons. There are subsidiary workshops at Umtali. First-, second-, and third-class accommodation, and special coaches for natives are provided. It is the exception for Europeans to travel third class. Second-class compartments hold six bunks, and first-class four bunks. On every coach there are one or two coupes (small two-bunk compartments). Dining-cars are provided, and bedding is available on long-distance trains. Private railway carriages are provided for shooting trips. These carriages accommodate six persons and contain saloon, kitchen, bedroom and bathroom. They are let at an inclusive monthly rate which covers travelling, attendance and catering. A short account of the route of the Rhodesian railways may be of interest. farther into the country of the Matabele. About six miles farther on is Westacre Junction, for the branch, nine miles long, to the Matopos Terminus, which is within six miles of Cecil Rhodes’ tomb at World’s View. In his will Rhodes directed that this branch line be built so that “the people of Bulawayo may enjoy the glories of the Matopos”. The line proceeds through the Bulawayo district to Khami Siding, eleven miles from Bulawayo, centre of a farming district. Six miles from Bulawayo is a farm, “Matabele Wilson’s”, which, in pre-railway days, was the last posting station on the Mafeking-Bulawayo coach road. 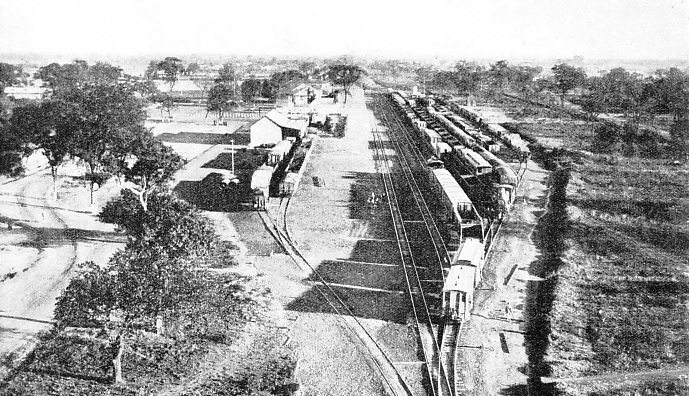 The line passes the workshops of the railway and enters Bulawayo Station. On the south side is Raylton, formerly “Railtown” the residential quarter of the railway staff. The station, 4,468 ft above the sea, is built on the site of what was once the military kraal of Lobengula’s regiment. Bul-awayo, the largest town in Matabeleland, has a population of 33,000, including 12,600 white people. The first settlers in 1893 started to build three miles to the north of the present town, but the following year abandoned the first site. Bulawayo, “the place of execution”, has grown into a thriving town, and is the most important commercial centre in Rhodesia. THE MEETING OF THE MAILS. 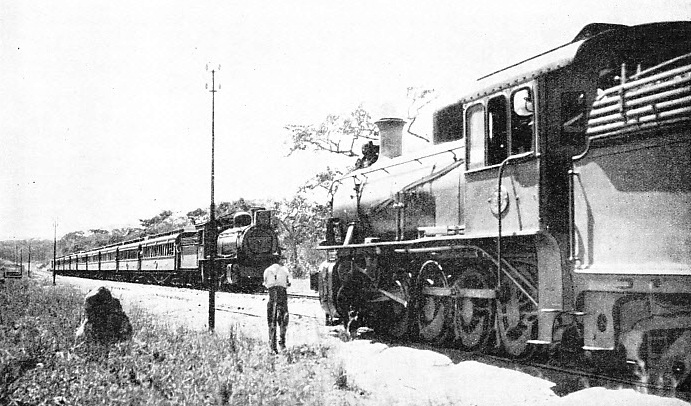 The north- and south-bound mails passing, on the main line at Wallamba, Northern Rhodesia, near the border of the Belgian Congo. The main line to the Victoria Falls leaves Bulawayo in a north-westerly direction, the scenery changing from rugged kopjes to undulating country as the line descends from Bulawayo. Between Bulawayo and the Wankie Colliery some extensive realinement has resulted in easier gradients. Between Gwaai River and Dett there is a section of seventy-three miles which at the time of building was the longest stretch of straight track in Africa. Leaving the town, the train descends in thirteen miles to Pasipas Siding, 4,178 ft, close to the west foot of the remarkable Pasipas Kopje. This hill of sandstone supplied the white, red, and pink freestone used in building Bulawayo. The stone has been sent to Salisbury, Mafeking. and Kimberley for building purposes, as it is equal to any quarried in South Africa or in Australia. Proceeding through other sidings the train reaches Nyamandhlovu Station, thirty-one miles, so named by the natives because it was “the place of the elephant” in the old days when herds of wild elephants roamed this district. At Igusi Siding, fifty miles, the train passes through Gwaai Forest, the ant-proof timber (Igusi) being used for building purposes. The line drops to 3,341 ft at Ngamo Siding, 107 miles, on the west of which is the Gwaai Native Reserve. Giraffes, elephants, and zebras are sometimes seen from the train. Intundhla, “the place of the giraffe”, is a siding at 125 miles, and soon after this the train enters the Wankie district. The native name “Wange” was the dynastic title of the Barotse chiefs of the tribe inhabiting the country. Malindi Siding, 147 miles, is a centre for big game hunters, Malindi meaning “the holes” (elephant pools). Some years ago a passenger train from the Victoria Falls was derailed by a herd of thirty elephants crossing the line. The engine was damaged and the cow-catcher was broken. A bull elephant killed in the collision measured 11 ft 1-in at the shoulder and had tusks 4 ft long; the skull is preserved at the siding. In the Wankie district other game includes eland and other similar species, lion, wild pig and giraffe and crocodiles. Wankie Station, 212 miles, at an altitude of 2,448 ft, lies in the centre of the coalfield. This important colliery area was opened up when the railway arrived in 1903. The mine had been developed from 1900, and directly the railway reached it, production expanded. Beyond Deka Siding (221 miles) the line begins to climb out of the coal area. Matetsi Siding, 248 miles, is some distance east of Pandama-tenka, “props of the sky”, so named because trees which were used for the centre poles for huts grew there. This place on the border of Bechuanaland and Rhodesia was at one time the only route to Barotseland, as all other routes were blocked by fly until the rinderpest of 1896 killed the game and the fly disappeared. The train now reaches Kesi Siding (3,489 ft.), fourteen miles from Victoria Falls, on the northern edge of the high Zambesi. Victoria Falls Station (2,994 ft) is 280 miles from Bulawayo. The train proceeds over the great bridge at five miles an hour and on to Livingstone, seven miles distant. The town, the first administrative capital of Northern Rhodesia, was founded in 1905, and is complete even to an eighteen-hole golf course. The present capital is Lusaka, opened on May 28, 1935. After leaving Livingstone the train climbs through pretty country to the higher plateau land at an average altitude of about 4,000 ft. There is bush country as far as Kalomo, 374 miles from Bulawayo, beyond which is open veld. From Kalomo to the Congo Border the distance is 413 miles. The train crosses the 1,300-ft long Kafue Bridge, previously described, and winds through hilly, beautiful country up to the higher but flatter lands of Lusaka. Through well-wooded country it goes to Broken Hill, famous for its mines, and 4,000 ft above sea-level. North from Broken Hill to the Congo Border, 133 miles, the line goes through mining country, Ndola being the last station in Rhodesia. The first station in the Belgian Congo is Sakania, whence the railway goes northwards to Elizabethville, the centre of the Katanga mining district, which is served by railways built to develop the vast copper resources. Branch lines serving various copper mines radiate from the main line at Ndola Station, in Rhodesia, and three through passenger trains run weekly in either direction over the main line to Livingstone. Also there are mixed trains with second-class and native accommodation, and a regular service is in operation for goods and mineral traffic. A LOG-TRAIN in Northern Rhodesia. The photograph shows loaded trucks of timber at the Bombwe Forest of the Zambesi Saw Mills, Livingstone. You can read more on “Developments in South Africa” and “South African Electrification” on this website.